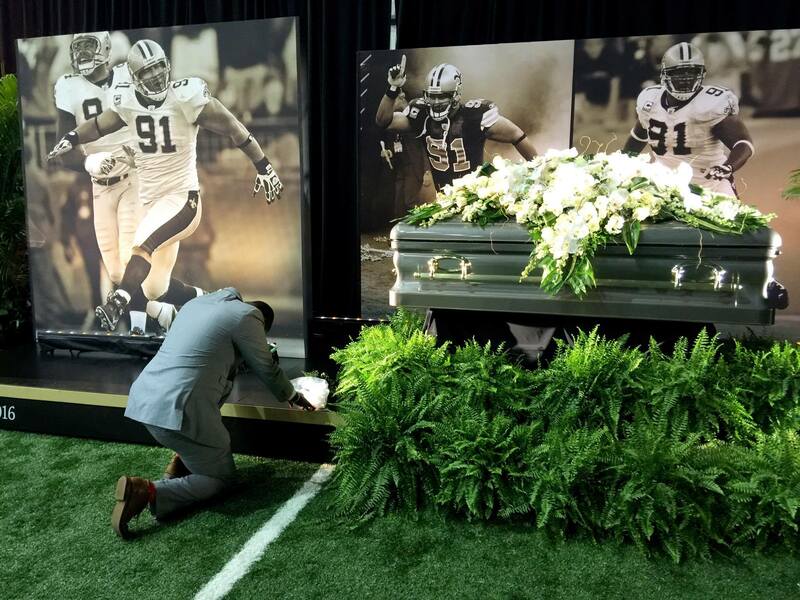 Family, friends and fans of the late football player, Will Smith, gathered at the Saints practice facility on Friday, April 15. to say their last goodbyes to Smith, who was killed a week ago. The Saints practice facility welcomed family, friends and fans of the late football player, Will Smith, for a public visitation on Friday. The visitation began at 2 p.m. but hundreds of fans lined up outside the facility hours before the doors opened to pay their last respects to Smith, who was shot and killed a week ago. Montrelle Fennidy, a long time Saints fan said she was heartbroken and sad by the loss of Smith. “This is such a devastating time for our city. This tragedy has stayed with me and I just had to come to get some closure,” Fennidy said. Inside, the entire facility was filled with several different forms of tribute to Smith, including video displays showing his career highlights, photos of Smith with his family and on the field, and lockers containing his sports gear. People entered the facility and walked around a black rope line, through the memorials to Smith’s flower covered casket, which was situated next to the Lombardi Trophy, that he helped Saints win, back in 2010. Along with the fans, several of Smith’s former teammates and coaches, such as Sean Payton, Cameron Jordan, Reggie Bush, Drew Brees and Sedrick Ellis were also in attendance. Sedrick Ellis met Smith in 2008 after he was drafted by the Saints and both quickly became great friends, regularly bonding over discussions on politics, travelling and video games. “He was an amazing person. We would always sit on the side of the football field and tell jokes to each other and laugh about our experiences in our travels around the world,” Ellis said. He added that Smith’s passing is great loss for everyone and that it’s ridiculous that his wife and kids have to go through this. “The message that we have to learn is that we have got to stop doing this to each other. Everybody is equal and we need to respect each other’s rights, space and lives. If there’s anything that we can take away from this horrible incident is to value our lives,” Ellis said. Ellis said one thing that he would miss the most about Smith is being able to travel with him. “We were great travelling partners; we went to a lot of different countries together. I’ll miss always being able to call him and saying hey, you want to go to Thailand? Or Brazil? That friend was taken from me and I just have to deal with that,” Ellis said. Robbie Guilimino, started coaching the Kenner Girls All-Star Basketball team along with Will Smith, after both of their daughters became close friends in school. He said he is extremely heartbroken by the senseless murder of Smith. “I pray for his family and children. His legacy will live on through them,” Guilimino said.